The Sloane Ranger term now takes a very different meaning, as all Londoners seem to wearing a safari-themed dress down the streets of Central London. What with animal print taking a leap of it's own last year, it is with no surprise than safari followed shortly afterwards. It also fits quite nicely into the tribal trend quite nicely too. This is gorgeous, and with it being in a warmer caramel colour I think it could roll into the winter too - so if you have £159 spare, buy it here! I've tried to find a few different takes on the look - not just the simple beige one. There are some really nice alternative colours and fittings that can still be worn in the same way you'd wear the above. Great to see a traditional British brand bringing out such a good trend piece - adding a military aspect to the shirt dress idea - so good it could easily become a staple. As it's Barbour, it's going to last you a long, long time - and at £90 its a little bit more reasonable. 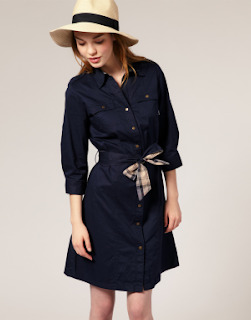 Navy (in my opinion) will never be unfashionable - so this could become a solid investment piece. For a totally different look, try a denim one. Denim on your top half goes really in, and then really out of fashion - so don't spend too much money on the look as soon enough you'll be considered to look like a red neck in it. Not that there is anything wrong with that... (apologies to any red necks). So I've found a cheap one, £40 from Reiss (above). 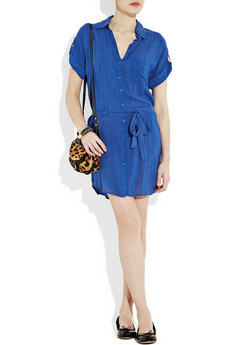 Love this dress, and at £25 from Vera Moda you can't go too far wrong! Wear with big sunglasses and some wedges - cute! 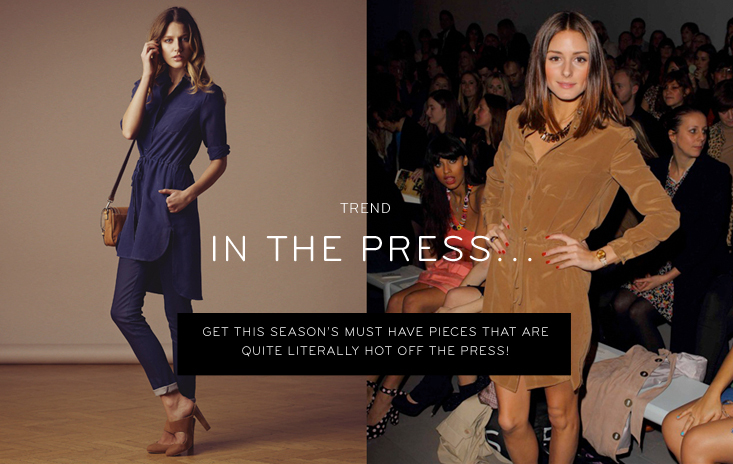 Anyway, enough from me - go and buy a shirt dress now!